A family-run bakery has teamed up with a celebrity chef to launch a crowdfunding campaign to fund a brand-new BBQ-style restaurant in Woodbridge. Third generation baker David Wright, who owns Fire Station Café and Cake Shop Bakery, is aiming to raise £75,000 to bring the new venture to life. He has teamed up with Christian Stevenson – also known as DJ BBQ – who has worked with Jamie Oliver and appeared on numerous television programmes. The pair will combine their skills to create something fresh, new and exciting in the town. David said: “It’s been well documented that bakeries, high street shops and restaurants are all struggling. “We are no exception and in this incredibly difficult time you must either adapt to the needs of the modern customer or face a very austere future. “We are very lucky to have some great resources built over three generations and I am lucky to have friends who are experts in their field such as Christian. “Making the most of what we have and showing that there is life in established business is what we’ve done for more than 70 years. The Cake Shop Bakery was opened by David’s grandparents in 1946 in a three-storey Victorian building in The Thoroughfare. The campaign will be launched on April 4 – the same day that Christian launches his third book, The Burger Book. 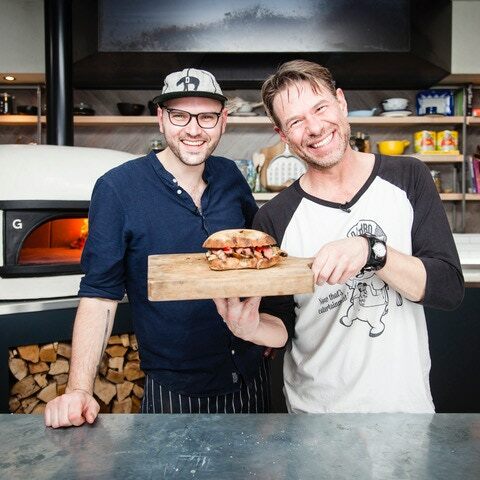 Christian, who is a live fire chef and pit master and has fronted shows for MTV, Channel 4 and Channel 5, said: “This is an incredible opportunity for me to team up with David, who in my opinion is the best baker in the world. The pair, who met at a festival in 2014 where Christian discovered David’s brioche buns were the “best burger buns he’s ever eaten”, want to raise £75,000 to kit out a new restaurant kitchen as well as buy new tables, chairs, toilets and two delivery bikes. A reward scheme has been set up to thank anyone who invests in the campaign – from a limited-edition badge by Lewis Heriz for a £5 contribution and a VIP launch party invitation for £200 right up to David and Christian visiting the supporter’s home for a BBQ cookout for 12 people in return for a £3,000 donation.